Gardening is naturally therapeutic and, at the same time, can be an artful expression of design. CIS will offer a gardening program intended for Seniors and other adults with disabilities. The course will offer on-site access to this popular hobby and past time and it will be innovative and restorative. It will offer participants a natural way to exercise and participate in community gardening activities. For wheelchair users, Seniors, seated gardeners or other individuals who cannot easily kneel to cultivate, prune or accomplish the little chores of gardening activities, CIS will provide raised pots and table planters. Horticulturists and consultants will demonstrate proven gardening techniques and adaptations for the disability community at CIS. 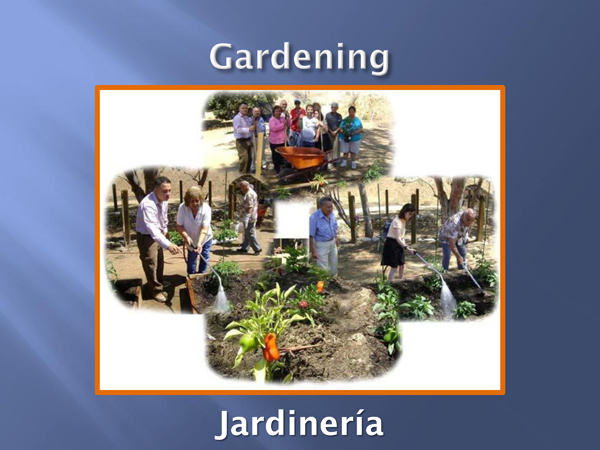 The gardening activity will allow anyone at any level of ability and mobility to participate in shopping, purchasing, planting, watering, weeding, maintaining and harvesting. Program participants will also be encouraged to teach their peers how to plant and grow a garden. They will be in an environment where they can breath the aroma of flowering plants, work the soil or simply enjoy gardening as a leisure pastime. Working in the garden can open up conversations and provide a "common ground" between people with different ability levels and backgrounds. It will assist in developing social skills as the participants enjoy the fruits of their labor together in meal preparation from the harvest. Part-time micro enterprise businesses may develop as well. Socialization is a key element in achieving independence, and the sharing of the planting and watering tasks will build friendships and cultivate a community spirit.